We speculated that the parabolic move in the Shanghai Composite could have topped after the hard break seen on July 29th where stocks dropped 7.7% in a single trading day. Since then the Chinese markets have been hit hard with more downside looking likely. After the break on 7/29, the Shanghai quickly recouped the pull-in but failed to significantly make new highs signaling the end of this move. August has been brutal so far with the Shanghai Composite trading off 12% from the highs of the current global stock market rally. Traders need to be watching the Chinese markets as the Shanghai has led the world in the global turnaround in equity prices. As the US markets were making new lows in early 2009 the Shanghai was making a higher low and fueling up for a large run. Chinese investors were treated to a doubling of their market from the low...but now a top has formed. It seems likely that this topping will reverberate through the world and stall other stock markets around the globe. 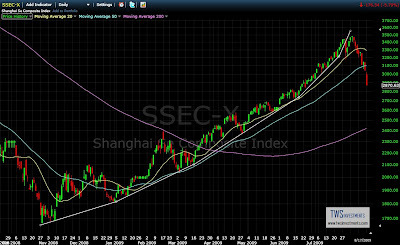 It would be wise to view the topping of the Chinese market as an indicator of a top in the US markets. Traders should look to be sellers at these levels and await a new time to buy back into stocks down the line.